For a background history of Rwanda and neighbouring Buruni, we recommend reading our article Rwanda and Burundi – A History, 1894-1990. The United Nations is often condemned for its role during the genocide. Usually the UN is accused of a cowardly reluctance to act forcefully enough to prevent the killings. In truth the United Nations was complicit in key stages of a monumental crime against humanity. The accusation of cowardice comes because UN troops were withdrawn from the country just as the massacres were beginning, and a later contingent of French forces, mandated by the UN to intervene, arrived in Rwanda only as the slaughter was tailing off. The real problem however is that these French troops were aiding the Rwandan army and its Hutu militia allies, the very forces butchering Rwanda's minority Tutsi population. France had been arming, training and funding the Habyarimana regime in Rwanda for years, years during which the Tutsi minority had already been subjected to ferocious persecution. The UN and great powers behind it must have known this very well before they endorsed the French intervention. 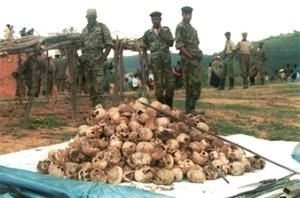 In 1994 the Rwandan regime was rapidly crumbling before a rebel army – the Rwanda Patriotic Front (RPF) - which, as it advanced, was putting a stop to the genocide in one region of the country after another. The speed of the rebels' advance meant life or death for tens of thousands of Tutsis. France intervened to create 'safe havens', supposedly to protect the lives of civilians from the majority Hutu group from Tutsi revenge. In reality they were attempting to slow the rebels' advance and protecting the remains of the Rwandan regime from them. As it turned out the French could not save the regime but did save the organisers of the genocide from capture. The 'safe havens' became a base from which these people engineered the flight of almost two million Hutus into neighbouring countries, where they have since languished in disease-ridden squalor under the control of the soldiers and militias of the fallen Government. These refugee camps then served as a springboard for armed incursions into Rwanda in which great numbers of Tutsis and anti-racist Hutus have died or been mutilated. There are remarkable parallels between the atrocities in Rwanda and East Timor: in the genocides themselves, planned at governmental level and carried out by an army and government-organised militias, and in the role played by USA and other western powers in arming these murderous regimes. And just as Australia was at the forefront in supplying and training Indonesia's military and in pushing the diplomatic cause of Suharto and Habibie worldwide, France acted as benefactor and international champion for the bestial regime in Rwanda. Just as an economic crisis was breaking in the late 1980s the Habyarimana Government faced a new armed threat. In neighbouring Uganda the National Resistance Army led by Yoweri Museveni had taken power in 1986. Many Tutsis, refugees from persecution in the early 1960s, had fought with the rebels. They now formed the Rwanda Patriotic Front (RPF). Although led by Tutsis the RPF was 40% Hutu in composition. In September 1990 it conquered territory in the north of the country and quickly gained support from Hutu farmers. Habyarimana would soon have fallen to the the well armed and trained RPF but for French military intervention. In October 1990 French forces seized Rwanda's international airport and turned the tide against the rebels. The battle with the RPF was used as a pretext to arrest up to 8,000 people in the capital Kigali, mostly Tutsis, and to launch pogroms in the countryside. French arms and military advisors poured into the country. In the following two years the Rwandan army grew from 5,000 to 30,000. In 1992 Lieutenant Colonel Chollet, commander of the French forces in Rwanda, became President Habyarimana's defacto army chief of staff. In February 1993 French forces again beat back an RPF attack. Cutting across all this were pressure from Belgium and from the Organisation of African Unity (OAU) for Rwanda to agree to a power sharing deal with the RPF. The OAU wanted to assert its own tattered authority and to prevent the conflict destabilising central Africa. Under this pressure Habyarimana allowed the reintroduction multi-party politics in June 1991, and brought moderate Hutu opponents into his Cabinet in 1992. This seems to have hardened sections of the ruling elite around a violently racist solution to the crisis. They now stepped up the organisation of the Hutu militias. Amnesty International has made similar allegations against the French government (Financial Times 12.7.94). In early April 1994 Habyarimana signed the Arusha peace accord accord with the RPF, at which he was suspected by his supporters of agreeing to share power with Tutsis – the former ruling minority group of Rwanda and Burundi. Returning from Arusha on 6 April he was killed when his plane was shot down, almost certainly the work of his own Presidential Guard. Less than 30 minutes later - even before his death was announced - the massacres began. The Presidential Guard began picking off opposition politicians, civil rights activists, and moderate Hutus, including the new Prime Minister Agatha Uwillingiymana. Then the army and Interahamwe were unleashed on the Tutsi population. The only force resisting the genocide was the RPF. How quickly it could advance each day against the collapsing Rwandan army meant life or death for tens of thousands of Tutsis. As soon as the scale of the massacres became clear the UN withdrew most of its 2,500 troops in the country. But the UN did not simply abandon the Rwanda. Amid a confusion of conflicting motives, the driving force of UN policy was French concern that their allies were losing the civil war, and that if action was not taken the RPF would soon smash the old regime altogether and capture its leadership. In June the UN sanctioned the intervention of 5,500 French troops in Rwanda. But two Belgian newspapers said French troops were already in Rwanda without waiting for UN permission. In Washington the State Department said the Secretary of State, Mr Warren Christopher, had informed his French counterpart, Mr Alain Juppe, that the US supported France's military initiative. As RPF forces swept through Rwanda in June, France, with endorsement from the UN Security Council, launched Operation Turquoise, setting up 'safe havens' protected by French troops along the border with Zaire. Allegedly to protect refugees, the havens were in fact designed to save the organisers of the genocide from the RPF. The leaders of the Hutu army and militias fled to these 'safe havens' with trucks, heavy weapons, and radio transmitters. They used the havens as bases for propaganda aimed at panicking ordinary Hutus into flight from Rwanda into Zaire. There were also reports of soldiers from the defeated government forcing people at gunpoint to cross the border into Zaire. Between one and two million Hutus became refugees. How did French forces, and their friends in the toppled Rwandan Government, assist these fleeing Hutu civilians in the safe havens? The militias were intending to use the refugees to reassert their control and used them as bargaining chips, a recruiting ground, and a springboard from which to destabilise the new RPF government in Rwanda. The refugees soon began to die from dehydration and cholera: the international aid effort did not supply anywhere near the support needed even to maintain lives. Meanwhile the militias commandeered food supplies and began launching incursions into Rwanda. “Several human rights groups and international organisations believe that France is behind efforts to hinder prosecution of Rwanda's former leaders. ‘The French Government wants to encourage the perception that there have been two genocides in Rwanda: one organised the the Hutus against the Tutsis, and a second one now organised by the RPF,’ said Sharon Cortoux, of Survie, a French group that monitors France's African policies. The UN-backed French intervention succeeded in allowing the organisers of the genocide to survive politically and militarily. The leaders fled to friendly countries such as Kenya, while the foot soldiers of the militia remained along the borders of Rwanda. France wanted to dominate the region. It wanted to protect economic interests in neighbouring Zaire, which, despite its ravaged economy, has great mineral wealth. Zaire was ruled at the time by the hated dictator Mobutu. Mobutu had a personal fortune of $5 billion, about the amount of Zaire's national debt. Wages in Zaire were a tenth of what they had at independence. Malnutrition was rife although Zaire has rich farming land, has suffered no drought and contains immense reserves of minerals, water and forests. But Mobutu was a loyal ally of the West. France also desired to maintain its international prestige and bargaining power by controlling French-speaking Africa, a group of twenty-one nations which included Rwanda. The RPF were led by English speakers. Earlier in 1994 the French Government, with the backing of the IMF and World Bank, imposed a devaluation of the CFA currency used by most former French African colonies. Now France feared additionally that the fall of the Rwandan government would connect with unrest in its own former colonies. France was not alone in having backed Rwanda's Habyarimana regime. Rwanda's army officers were trained in Belgium and the USA. The white apartheid government in South Africa sold arms to Habyarimana, as did several countries of the old Eastern bloc. The USA and most other western powers were not, however, committed to the Rwandan regime in the same sense as was France. In fact the USA soon moved to ally with the new RPF Government in Rwanda, welcoming the chance for a counter-weight to French influence in the region. But neither the USA nor any other Western power saw an interest in exposing France's complicity in the killings, far less confronting it on the ground. France is part of the alliance of Western nations dominating the globe that form the core of the UN Security Council and dominate the decisions of the UN as a whole. Minor strategic differences, such as whether or not to back a genocidal regime in Africa, are not allowed to disturb this underlying harmony of purpose.